Payday loans, pawnbrokers or neither? 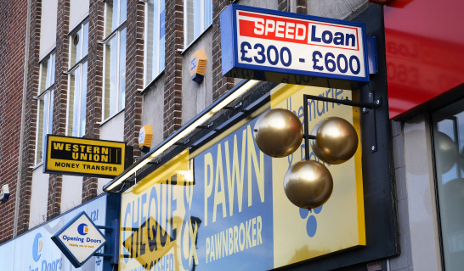 The number of pawnbrokers in the UK has trebled in the past seven years, while payday loans are also on the rise. The question is whether there’s a lesser of these two ‘evils’ or if we should avoid them both. Back in the days before the credit crunch – which now feels so distant that it’s almost as if we dreamt it – companies seemed to hand out loans and credit cards like candy. But after the financial crisis, credit wasn’t so easy to come by – particularly if you had a less-than-spotless credit history. This situation, which has persisted ever since, has arguably pushed consumers into the arms of less ‘mainstream’ lenders. According to Consumer Focus, the number of payday loans extended to British consumers has quadrupled since 2006. In theory, these are loans designed to tide people over temporarily. However, payday loans come with APRs as high as 2,000%. Critics argue that they’re used by vulnerable people whose money problems can be made worse by the repeated ‘rolling over’ of borrowing – so a short-term cash injection can become a long-term debt demon. But there’s also been an explosion in the number of pawnbrokers operating in the UK – there’s apparently almost three times as many pawnbrokers as seven years ago – and they’re taking the fight to high APR lenders. Caught between the devil and the deep blue sea? Those in the pawnbrokers business are keen to cast off the dark, Dickensian image many of us have of it, claiming that soon they’ll be as common as coffee shops on British high streets. So is it better to pawn your jewellery for some quick cash, or sign up for an extortionately-priced payday loan? In theory, pawnbrokers may be the cheaper option – typically the sums they charge for loans equate to APRs in the hundreds, not the thousands. Yet there’s always the risk that you’ll lose whatever item you handed over as ‘security’ on your loan. Overall, I think there’s no escaping the fact that both pawnbrokers and payday lenders charge way over the odds for credit. In my opinion, it’s best to avoid both. Don’t forget, you could consider approaching your local credit union if you’re in need of a loan and can’t get it from your bank. Still, figures like those above show there’s a desire – or, more worryingly, a need – for quick credit, apparently at almost any cost. Only when people who’re excluded from mainstream credit have access to affordable loans, can this situation change. We cannot avoid using this because if we don’t have money and no one can help us including our families, you have no other choices. You can either find a lender and apply for a payday loan. Completely agree with James – It depends on circumstances – If one has no money – or living below the poverty line – one cannot get credit from other sources. So one pawns items or takes a payday loan – or starves. Whereas Pawn Shops have traditionally been the way to raise temporary loans on owned goods – with the advantage that if one could not pay the loan back in time – the Pawnbroker kept the goods and sold them – An excellent system. Operational since before 1900. I have never used either – but know some that have. Has your credit card rate ever been jacked? How much should a wedding cost?